Owen Grady wants nothing to do with dinosaurs. Nothing. That’s partially why he’s building a cabin in a remote mountainous area, far removed from the ocean and from Isla Nublar – the island which he escaped from three years earlier after dinosaurs took over the Jurassic World theme park. He hasn’t been back since, and he has no desire to return. Claire Dearing, though, thinks she can change his mind. As head of the Dinosaur Protection Group, Dearing is working to rescue those abandoned dinosaurs on Isla Nublar before a deadly volcano erupts and puts them back on the extinction list. And she’s found a wealthy man – a dinosaur lover named Benjamin Lockwood – to fund the trip. Lockwood was one of the men who helped clone dinosaurs the last time, but this time he’s wanting to do it the right way. He’ll place them on an unhabituated remote island and let them live alone – as nature intended, he says. It sounds like a great plan, but will it work? After all, these Jurassic stories never end well. 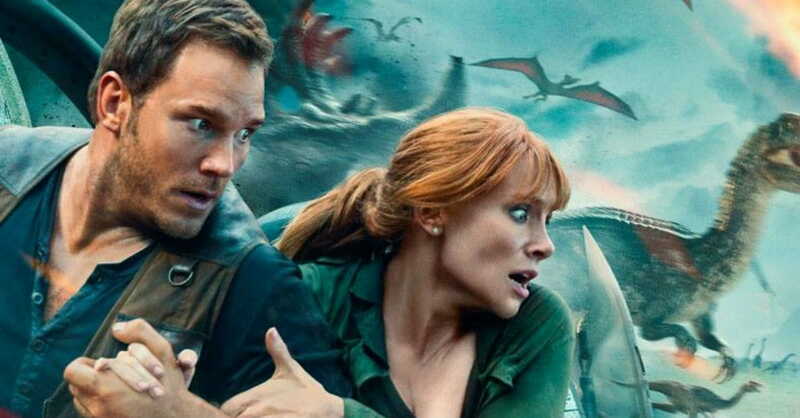 Jurassic World: Fallen Kingdom (PG-13) opens this weekend, starring Chris Pratt (Jurassic World, Guardians of the Galaxy series) as Grady, Bryce Dallas Howard (Jurassic World, Pete’s Dragon) as Dearing, and Rafe Spall (The Big Short) as Lockwood’s assistant, Eli Mills. At least, it is for those of us who enjoy being scared by dinosaurs. Yes, we know the good guys likely are going to survive. Yes, we know some of the bad guys won’t make it to the credits. I’m not a fan of thriller or horror movies, but I’ve enjoyed the Jurassic Park series. Perhaps that’s because I know there aren’t dinosaurs outside my window at night. Right? 2. It’s the second film in a trilogy. Don’t expect to walk out of the theaters with finality. In fact, the film’s final scene made me want to watch the next film immediately. Unfortunately, we’ll have to wait until 2021. Jurassic World: Fallen Kingdomfalls after the events of 2015’s film, Jurassic World, which fell after events of the earlier Jurassic Park trilogy. And it’s not for young children. There’s a dinosaur-chasing-human scene virtually every five minutes. The opening scene shows a creature eating a man, and the closing scenes show a dinosaur biting off a man’s arm. In between, we see a dinosaur chase a girl down a hallway, a dinosaur chase a teenager up a ladder, and a volcano erupting and threatening to kill everyone. When dinosaurs aren’t chasing people, they’re fighting one another. My young kids would have nightmares if they watched it. 4. It has some language. I counted about 17 coarse words: d—n (4), OMG (3), h-ll (3), misuse of “Jesus” (2), misuse of “God” (1), SOB (1), s—t (1), ba—ard (1) and a—(1). Also: pi—d (1) and an unfinished s—t (1). 5. The sexuality/sensuality is minimal. We see Dearing accidentally fall asleep on Grady’s shoulder, and later they share a brief kiss. Dearing also displays a bit of cleavage in one scene. 6. It can spark conversations about science and ethics. Such as: Would you support using science to bring extinct creatures back to life? It may be hypothetical with dinosaurs, but it’s not with the wooly mammoth – an extinct creature that some scientists say can be “resurrected” in the laboratory. For parents of teens, it also may be worth discussing the ethics of human embryo research. Scientists in our world are creating babies with three biological parents. They’re also making “designer” babies whose genes no longer carry traits for certain diseases. In the future, scientists may have the power to make “super” babies who are gifted with athleticism or academic prowess. Of course, scientists already are conducting research on aborted babies. Perhaps our world isn’t that much different than the big-screen version. 7. It can lead to theological discussions, too. During a Senate hearing to discuss what should be done with the dinosaurs, Ian Malcolm of Jurassic Park lore tells the committee members: “God’s not part of the equation.” The implication: God has no role in what happens. Really? It’s worth talking about on the drive home.